Within the homely atmosphere of a family run Hotel, your relaxation and enjoyment are our priorities. The 19th century hotel lies within a conservation area and is surrounded by historical cairns and henges. The Kilmartin area is the perfect location for your fishing holiday. Experience the fishing in the last wilderness of Europe and look out that the Golden Eagle or the Osprey is not catching your trout. 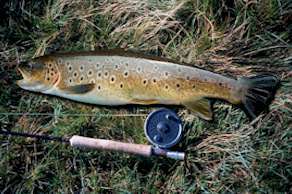 Aboveis a 4lb brown trout caught on the fly in Loch Awe where in 2002 a massive 32lb ferox trout was caught. Loch Awe is but only a 15 minute drive from Kilmartin and stocks brown trout, ferox trout, rainbow trout, perch and specimen pike. Kilmartin Hotel, Kilmartin, Argyll, PA31 8RQ. Our aims for your break include a comfortable standard of accommodation coupled with an extensive choice of wholesome fayre from our bar meal restaurant menus. Famous whisky bar and real ales on tap.